Click here for further details about Charly-stua. Lofoten Peat Museum in Fredvang owns an old timber-built house that dates back to the 1900s. 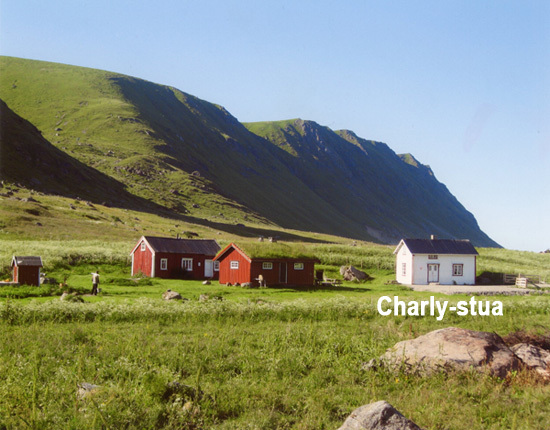 The house was relocated to Fredvang from Værøy in 1927 and then again to Lofoten Peat Museum in 2011. In the old days it was quite common to take your house with you when you moved. Consequently the house has an atmosphere of history and nostalgia, and many of the things inside the building have their own story to tell, giving the house its soul. The house shows how a fisherman-farmer lived around the year 1900. There are two bedrooms upstairs in the house with 6 beds and room for more if required. Downstairs there is a kitchen and sitting room. In the sitting room there is a wood stove used to heat the house. There is no electricity. There is running water in the house, but no hot water. The kitchen is fully equipped, including gas for cooking. Charly-stua is about 150 metres from the main road. There is a toilet 50 metres from the house. A stay in this unique Nordland-style house is a stay at a museum presenting the story of how the fisherman-farmer lived and worked. You will also be staying only a stone’s throw away from the mountains, and all the opportunities for relaxation and outdoor life found there. These mountains at Fredvang on the island of Moskenesøya will in all probability be a part of Lofotodden National Park which is under planning, making the area even more attractive. We wish you welcome to an unforgettable stay at Charly-stua, a memory for life. Click here for further information.